The Polish Lowland Sheepdog is a medium sized, shaggy working dog. The head is moderately broad and slightly domed. The drop ears are heart-shaped and set moderately high. The eyes are hazel or brown, but can also be blue, although it is not accepted in the AKC show ring. The nose is dark. The teeth meet in a level bite. The back is level and fairly broad. The loins and thighs are well-muscled and broad. The tail is a natural bobtail or is docked short. The Polish Lowland Sheepdog has a long, wirehaired coat with a soft under-layer. All coat colors are permitted, but white with gray or black, or plain gray are more common. 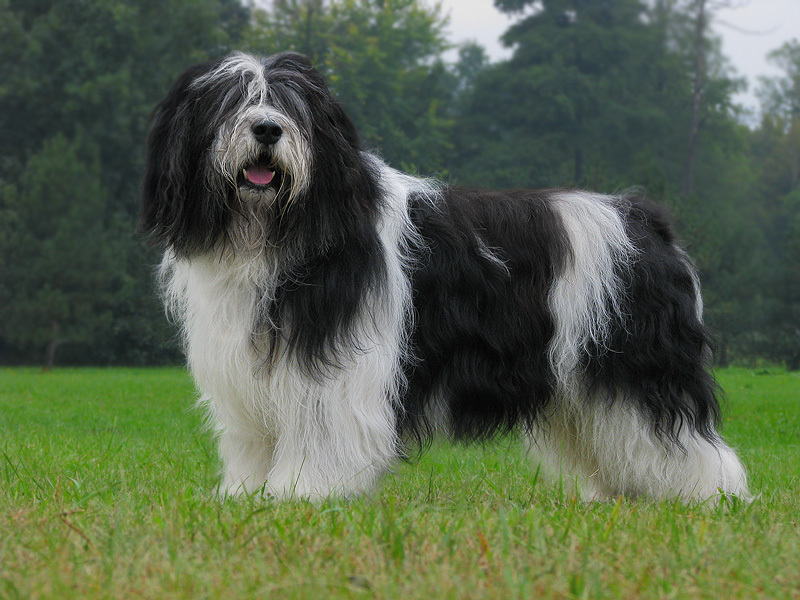 The Polish Lowland Sheepdog has a lot of hair on its forehead, cheeks, chin and legs. PONs need a lot of activity to remain happy and healthy. They were designed to work long days herding flocks great distances, so they have stamina to spare. They are well-behaved indoors and this, coupled with their medium size makes them attractive to people who live in apartments or condominiums. If your house does not have a yard, a commitment needs to be made to walk your PON and allow him to run every single day. As a working dog for many centuries, the Polish Lowland Sheepdog is happiest when it is given a job to do. This breed is lively and clever enough to work sheep alone. This cute, shaggy dog does not grow into a calm, little lap-dog. The Polish Lowland Sheepdog is a curious, muscular, agile dog that is liable to find trouble if left alone without leadership and the proper mental and physical exercise. These natural watchdogs are very loyal to the ones they love and are naturally wary of strangers. It is important to socialize your PON early and often, so that he knows how to spot a welcome guest versus an unwelcome guest. They also have trouble understanding how children play, and won't take kindly to a neighborhood child playing rough with one of “his” kids.